ELIZABETH TAYLOR—the English novelist, not the American actress, which is part of the problem—is one of those writers who gets periodically picked up and dusted off. “Look at this,” people say, wondering why such a lovely, delicate thing should be left to molder. But there are a few obvious reasons why: the bad luck of the name; Taylor’s own reluctance to proclaim herself a writer (she rarely gave interviews or associated with the literati); the “lending-library aura that hangs around her work,” as her biographer, Nicola Beauman, gently put it; Taylor’s interest in the foibles of the Thames Valley bourgeoisie at a time when England was getting plain fed up with that class; the clean sporting elegance of her language, which perhaps began to feel antiquated around about 1964. It may be unfair to add to this list the protective, almost cloying warmth of her supporters, but it is certainly tempting. If after fifty years of articles exclaiming that we must, must read Elizabeth Taylor, we are a bit less inclined to, who can blame us? Kingsley Amis, who did more than anyone to undo her wallpapered-parlor image through a series of powerfully worded, almost angry reviews during her lifetime, still wrote defensively after her death in 1975 that Taylor’s “deeply unsensational style and subject-matter saw to it that, in life, she never received her due as one of the best English novelists born in this century. I hope she will in the future.” By 1986, Anita Brookner was noting: “it is time that justice was done to Elizabeth Taylor, the Jane Austen of the 1950s and 1960s, a writer so beautifully modest that few have taken up the cudgels on her behalf.” The frequent comparison to Austen, as well as to other underappreciated, “lending-library”-type female writers like Elizabeth Bowen or Barbara Pym, seems particularly counterproductive. Under these circumstances, the New York Review Books Classics re-issue of two Taylor novels, A Game of Hide and Seek and Angel, and the planned release of a third novel and a collection of short stories in 2013, is truly exciting. For years, Taylor’s short stories—painfully smart, hilarious, dark—have been entirely out of print in the United States, and available only through the Virago Press in Britain. These editions came with thoughtful introductions, but off-putting Easter-egg-colored covers showing what look like dramatic stills from black-and-white movies, entirely distinct from the book’s contents. The aim was evidently to gussy Taylor up as an a la mode woman’s writer (Valerie Martin in her introduction to At Mrs. Lippincote’s: “Taylor is the thinking person’s dangerous housewife”), a pigeonhole that, however necessary marketing-wise, still does her some damage. The new editions, blessedly, sell themselves with broader ambition. The covers are not pastel. The jacket copy compares Taylor to Graham Greene, Richard Yates, and Michelangelo Antonioni, without a single mention of Jane Austen. Angel includes an astute introduction from the Virago edition by Hilary Mantel; Caleb Crain does a subtle job placing A Game of Hide and Seek in the context of Taylor’s own life and work. We are thus free to enjoy the novels without feeling that we are participating in some awkward posthumous dress-up party. 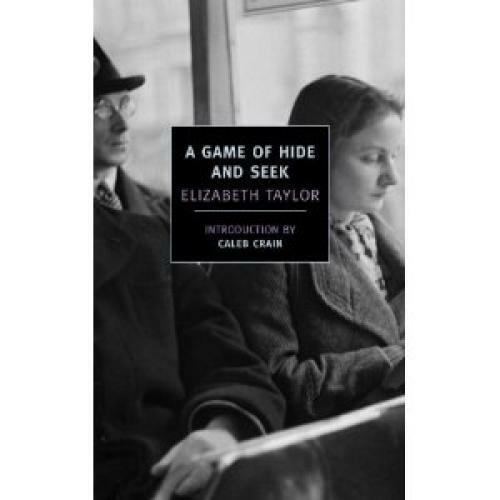 A Game of Hide and Seek, first published in 1951, tells an inconvenient and painful love story. Harriet’s mother and Vesey’s aunt are best friends, bonded by their years in the suffragette movement. But Harriet and Vesey are both disappointments: Harriet is unambitious, showing “no inclination to become a doctor or a lawyer, still less to storm some still masculine stronghold, the Stock-Exchange or holy orders”; Vesey is dramatic and manipulative, an overcompensation for the haphazard affections of his self-centered mother. In their teens, playing complicated games with the younger cousins Harriet is meant to be babysitting, the two fall in love; on Harriet’s end, swooningly and awkwardly, with lots of jotting in her diaries and squirreling away of keepsakes; on Vesey’s end, no less sincerely, but with a great deal of teenage cruelty mingled with “its other side of appalled tenderness.” The two are splintered both by their own flaws—Vesey’s insensitivity, Harriet’s inability to openly stake a claim—and by the ungenerous interventions of their elders. Vesey is packed off to university, while Harriet starts a new job in a gown shop and falls into a relationship with Charles Jephcott, “an elderly man of about thirty-five,” out of passivity and loneliness. After Vesey stands her up at a dance—and after her mother dies, and Charles tends her through her grief—Harriet submits to marrying Charles. The novel then leaps forward two decades. Harriet, now a middle-aged woman with a teenage daughter, has spent the time attempting to make up for not loving her husband through feverish housekeeping: “When she married Charles, she had seemed to wed also a social order. A convert to it, and to provincial life, and keeping house, she had pursued it fanatically and as if she feared censure.” Vesey, meanwhile, is a failing actor, playing Laertes in gaudy productions of Hamlet. When they reconnect, his old cruel arrogance has been dissolved by time and misfortune, and Harriet begins risking her hard-won, if deadening, stability to meet him in sordid railway cafes and on park benches. Vesey is the only one who has ever really known her, and vice versa: their mutual understanding is impossible to resist. Both feel, as Vesey puts it to himself, the “desire to unpack his life in her presence, to lay before her treasure after treasure (or, rather, loss, laughter, disappointment).” At the same time Vesey is also highly aware of the costs to the child of an unfaithful parent—and Harriet’s daughter, discovering hints of the affair, begins to wither. The ambiguous ending, Taylor’s best, like a perfect bubble that never bursts, is a moving refusal to render final judgment on any of the imperfect, well-meaning bumblers who make up the story. In her biography, The Other Elizabeth Taylor, which appeared in 2009, Beauman published for the first time excerpts from a series of letters written from Taylor to a lover, Raymond Russell, over the first decade of her marriage (Taylor destroyed her side of the correspondence). The letters are passionate, ambitious, and highly literary—in other words, they do not describe Harriet’s feelings toward Vesey, however much Taylor may have drawn on the relationship in other ways. Still, it is tempting to find autobiographical information in Harriet’s despair at the dull conventions of provincial homemaking and the isolation of an unequal marriage. Taylor spent her days proclaiming to all who would listen that she found her monotonous, out-of-the-way life as a mother, a wife, and a backroom writer congenial—“I have had a rather uneventful life, thank God,” was a regular refrain. But A Game of Hide and Seek has some more subversive undercurrents, particularly in its treatment of feminism. While the two suffragettes in the novel, like most Taylor characters, are portrayed as slightly ridiculous, confused about their own motives, and occasionally hypocritical in their private lives, the protest line and the prison where they cement their friendship provide the background for a clear, true human connection. When Harriet’s mother dies, her old suffragette friend thinks that their intimacy “had no flaws, as Harriet’s relationship with her mother had flaws. At the moment, with middle-age upon them, she felt she could dispense with this friendship less than anything else in her life.” There is no other relationship in the book so pure: certainly not Harriet and Vesey’s, with its hundreds of accumulated misunderstandings and wounds. The gown shop where Harriet works briefly is another place of feminine solidarity against the encroachment and trickery of men; Harriet later says to Vesey, “One becomes very close to people one works with—in a distinctive, a particular way, don’t you think?” While the Vesey-Harriet relationship gives the book its dramatic and emotional propulsion, the connections between three generations of women—Harriet and her mother, Harriet and her daughter, Harriet’s daughter and a beloved schoolteacher—are what provide its substance. These women are frustrated and in need of an outlet. They find it in warm female friendship or, for Harriet, in hopeless love affairs, as Taylor herself would find it in fiction. And it is finally suggested (although Taylor, of course, was no great optimist when it came to human progress) that Harriet’s daughter, a bright student born after the war who idolizes her feminist grandmother, may well storm some of the masculine strongholds at which Harriet shrugged her shoulders. Angel, published in 1957, also has some obvious biographical links. (She once wrote, “I’ve no imagination and can only write of what I know.”) The protagonist is a precocious novelist from a provincial town who toils in the shadows before achieving renown. But there the resemblance ends. Angelica Deverell, daughter of a grocer, is a great romanticist. She composes school essays on the “vast vacuity of the empyrean” that get her unfairly in trouble for plagiarism and cooks up elaborate visions of Paradise House, the estate where her aunt serves as a lady’s maid, imagining it as an opulent villa with white peacocks on the lawn and herself as its rightful mistress. When she gets in trouble for her fantasizing, she leaves school at age fifteen and begins writing novels. Angel’s literary style is exactly the opposite of Taylor’s. If Taylor disparaged her own imagination, it was perhaps in sly defense of her opposite skills of emotional precision and tight observation. But Angel has no interest in the surrounding world: “She had removed herself, romantically, from the evidence of her senses: the reality of what she could learn by touching, tasting, was banished as a trivial annoyance, scored out as irrelevant.” Nor is she curious about other writers: “I quite liked Shakespeare,” she says when her publisher, Theo Gilbright, asks tentatively who she reads, “except when he is trying to be funny.” As a result of Angel’s entirely unschooled, untrammeled imaginative force, her plots are wild, beyond the bounds of logic or good taste: her first published novel, The Lady Irania, includes a scene in which the eponymous lady’s virtue is gambled away over a game of cards. (“I didn’t say ‘sleep’ [with], I said ‘lie with,’” Angel protests after Theo suggests the scene could use some re-thinking.) Despite vicious reviews, the book does extremely well, and Angel begins her inexorable rise through the ranks of class and literary society. The genius of Angel is Taylor’s ability to contain the shallow operatics of Angel’s writing within her own delicately woven story. The authorial voice in Angel feels more obtrusive than in Taylor’s other fiction, if only because we are constantly aware of how much it differs from Angel’s voice, with its “dazzling marble and diaphanous draperies.” Taylor, meanwhile, describes children playing under the spray of a watering-truck in a gritty area of Chelsea as artfully as any white peacock: “They leapt into the edges of the arching spray and jumped over the water which began to criss-cross down the gutters, trickling dust-coated to the drains.” If there is a stand-in for Taylor in the novel, at least on aesthetic grounds, it is Angel’s ill-fated love interest, Esmé Howe-Nevinson, an auxiliary member of the local aristocracy and a painter of daily, sordid life: “Such horrible pictures!” his uncle exclaims. “Barmaids and jockeys, barges in the fog, back-streets in the pouring rain, slag heaps … the seamy side of life. …” Angel’s efforts to seduce Esmé and to subjugate his seamy realism to her sense of romanticism by trying to force him to paint her portrait “in one of her low-cut evening gowns or with white lace to the throat” meet with varying levels of resistance. They eventually marry, with tragic results. Taylor, who had her own affection for barmaids and jockeys, seems like Esmé to be both philosophically at odds with Angel and occasionally softened by the poignancy of her obsessive loneliness. Angel may be a monster, but she is never unappealing. A Game of Hide and Seek, with its iterative structure (Harriet and Vesey meeting again and again, and always thwarted), heartbreaking ending, and subtle but unmistakable gender politics, is one of Taylor’s best two or three novels; Angel doesn’t reach that level. But both of them stand on their own, without any need for help from supportive critics, as great literary pleasures. I won’t say that you must read them—only that you will be happy if you do.